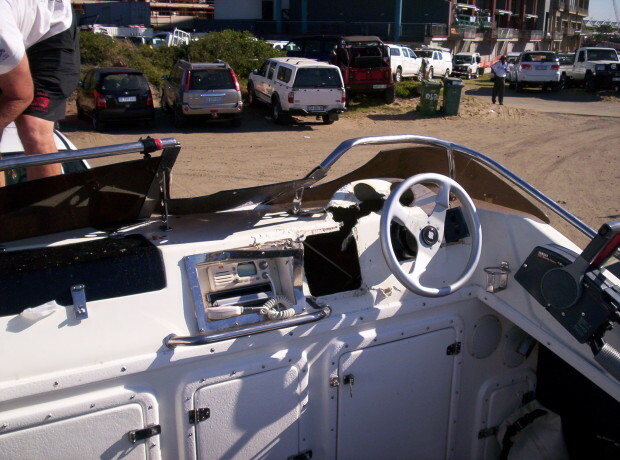 Two South African anglers were seriously injured when a hooked marlin launched itself at their boat and smashed through its windscreen, officials said today. It has emerged, on reflection of this incident, based on doctors findings of the injuries sustained, and based on the two injured men’s accounts of the incident, that the Marlin that jumped into the boat had impaled both men as it crashed over the boat. It was at first suggested, when NSRI arrived on the scene, that the Marlins bill had impaled both men but this was later discounted by the skipper and his fellow crewman who were trying to make sense of what had actually happened in the incident which lasted only seconds before the Marlin disappeared back into the water over the back of the boat. But on reflection of the incident by all 4 crewman and based on the extent and nature of the injuries it has been confirmed that severe injuries sustained to both fishermen were caused by the Marlin’s bill which impaled both men as it crashed through and over the boat. The two injured fishermen are recovering in hospital. Clifford Ireland, NSRI Durban station commander, said: “At 11h45, Saturday, 26th April, NSRI Durban crew and Netcare 911 ambulance services, while on stand-by at the NSRI Durban sea rescue base for the Durban Ski-boat Festival, were activated following a request for urgent medical assistance from the 5.5 meter ski-boat MDUDUZE, for two crewmen seriously injured when a Marlin that was being fished using a line and rod jumped into the boat and over the back of the boat during the fishing competition, causing injuries to two of the crewmen, 2.5 nautical miles off-shore of Umdloti which is 12.5 nautical miles from the Port of Durban. There were 4 men on the boat at the time. “The two men injured are a 35 year old crewman and a 33 year old crewman. Both are from Kloof, Durban. NSRI have not been given permission to release their names. “According to skipper Marc Gieseler, of Durban, his 35 year old crewman was steering the boat at the time while Marc wrestled to reel in an approximately 140kg Marlin on his rod and line. On reeling the Marlin towards the boat the Marlin had launched out of the water in front of the boat and crashed over the front of the boat and then through the windscreen and the fin of the Marlin clipped the 35 year old man on the left side, chest and back torso, causing him to fall over backwards onto the 33 year old crewman who was then pushed backwards and on falling over backwards he had landed with his back on a fishing rod holder. The incident caused severe injuries to both crewman. “The 35 year old crewman has a laceration to his back, de-gloving of his rib cage and laceration to his stomach, and the 33 year old crewman has a laceration and puncture wound to his shoulder and back. “Our NSRI Durban volunteer sea rescue duty crew launched our sea rescue craft EIKOS RESCUER II and MEGAN II, accompanied by a Netcare 911 paramedic and responded. “On arrival on-scene both men were found to be in serious conditions. “The boat was also found to have sustained extensive damage. “Both patients were transferred onto the sea rescue craft MEGAN II and both were medically treated by the Netcare 911 paramedic, assisted by our NSRI medics, and rushed to our sea rescue station where they were both transferred into a waiting Netcare 911 ambulance and transported to hospital in serious but stable conditions. “Both crew members are in stable but serious condition in the Intensive Care Unit in hospital and are being cared for by hospital staff. Both men are expected to fully recover.